I wanted to try out something nice with Shimeji mushrooms as I really like them a lot. They are nice and crunchy, in fact better tasting than button mushrooms. I found this recipe very simple and delicious. We had it like an appetizer. Potatoes ................. 2 medium sized. Olive oil .......... 3 - 4 tbsps. 1. Peel and cut the potatoes into cubes. 2. 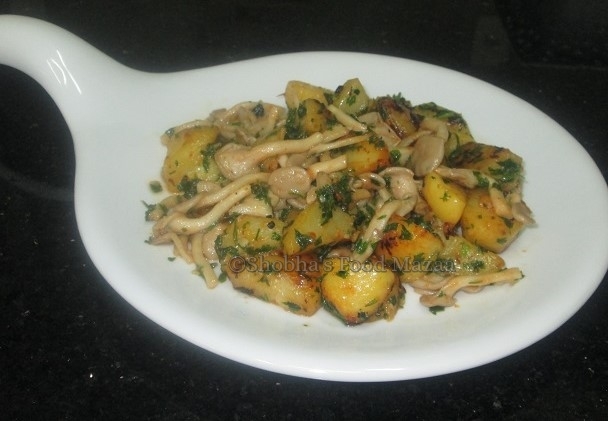 Heat the olive oil lightly in a wok and fry the mushrooms. Simmer them until they are done and slightly brown in colour. Remove them from the wok. 3. In the same wok tip in the shimeji mushrooms and garlic. Add a little oil if needed. 4. Saute them until the water is dried up and the mushrooms are done. It takes a few minutes. 5. Now add the finely chopped parsley, salt, black pepper and mayonnaise. Stir well to mix. 6. Add the potatoes and stir carefully to avoid them from breaking. 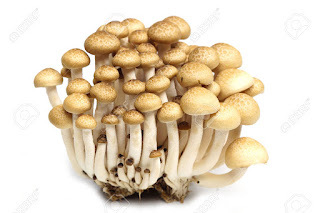 I often see these Shimeji mushrooms in the supermarket but never cooked with them. I like your idea of cooking them with potatoes. The addition of parsley sounds great too.